Application was created primarily for Canadian Real Estate agents. Application was developed in HD so it will look great on the iPad. By calculating a mortgage you will know the Income required for a purchase and all fees required to complete a sale. Having access to these 6 calculators allows you to quickly answer client questions with style. - Calculator 1: Mortgage payment which includes CMHC/GE portion and Income required. - Calculator 2: CMHC/GE portion of a purchase. 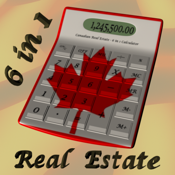 - Calculator 3: Land Transfer Tax options for first time buyers and Toronto properties. - Calculator 4: Rent vs. Buy payment comparison costs including taxes and insurance. - Calculator 5: Sales Remuneration with adjustable ratios for both listing and selling. - Calculator 6: Square Footage/Meters for both rectangular and triangular areas. More Images are available on the web site link.